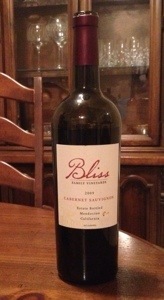 Bliss Mendocino California Cab 09. Elegant, almost delicate yet with robust fruit, ripe blackberries, leather, dark chocolate, spice & soft tannins. Balanced. Charming.